Growth is the major theme in Tracie Vaughn Zimmer's novel in verse, Reaching for Sun, and it is beautifully expressed through the metaphor of flowers in a garden. Josie is thirteen and the seedling in a family which includes a horticulture student mother and a wildflower gardening grandmother. Her cerebral palsy has made it challenging for Josie to make friends with her peers, so much of her interactions are limited to her family, until a new neighbor named Jordan comes around. The development of their relationship is the best part of the book--they fill a need in each other, yet there is a messy and complicated side to their friendship. It feels so realistic for two kids who haven't had many friends in the past. something with a title or abbreviations, I guess. While they may not have cerebral palsy to contend with, at one time or another, all readers have felt like Josie in the last few lines. 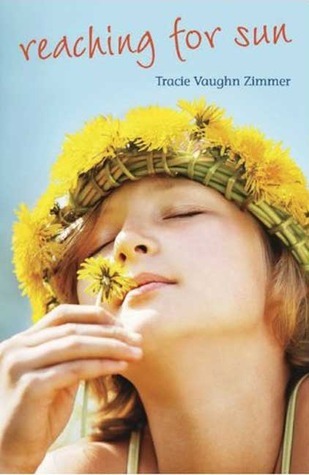 Tracie Vaughn Zimmer is a talented writer, weaving descriptive language throughout her poems. I look forward to more novels in verse from her. Wasn't it lovely?! I absolutely adored this book and I'm glad to see you did too =) I haven't read any more books from her yet but I do know she has another novel in verse titled, "42 Miles." It's been on my TBR ever since I finished this one! That's awesome, I will have to check my school library for 42 miles. Thanks!